Birds, locally called ‘Kank’ or open billed stork, are thronging Sirabahal village in Deogaon block during the ongoing winter, much to the joy of bird watchers. The village is 15 km from here and given the safety ensured to them by the locals, the winged guests have been coming here every year over the last decade. These birds usually come in the month of June or just before the festival of Sitalsashti. “We do not know where these birds come from and fly back after they have a short stint here till Kartik Purnima,” says a villager. Initially, when the birds came here, there was no dearth of poachers but the locals provided them safety. Consequently, poaching is a thing of the past here. After staying here for four months, these birds leave for their native destinations. Only those who give birth to chicks stay here, says Dibya Lochan Biswal, a villager. “We believe these birds as the harbinger of monsoon. 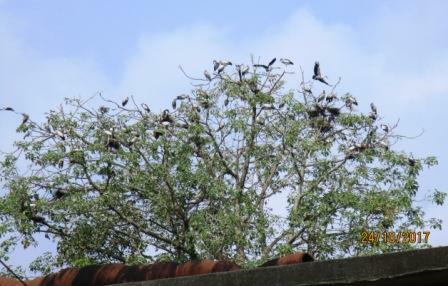 Around 1,500 birds are staying in different trees of our village near the pond and mango trees. While they reside in mango and others trees, usually Banyan and Pipal tree branches regenerate to the impact of the acidic stool of birds,” points out the Biswal further. These birds are coming to the villages as they are finding it a safe place to stay and form nest. There is a symbiotic relationship between the people and birds since they love each other. Paddy crops are also protected as these birds eat away snail and other insects, says a bird lover.